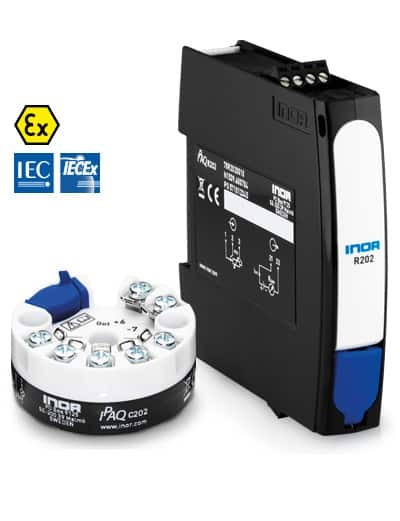 INOR continuously strives to develop and offer products and services meeting the highest requirements and expectations on reliability, stability and user-friendliness. It is therefore with great pleasure INOR launches the IPAQ 202, a temperature transmitter optimized for Pt100-applications! IPAQ 202 is a digital, easy-to-use temperature transmitter developed specifically for measurements with Pt100 sensors. Its robust design and high quality gives excellent performance and accuracy also under harsh conditions. IPAQ 202 is available both as head mounted(C202) and rail mounted (R202) versions. The IPAQ C202 is also available with ATEX and IECEx certificates making it suitable for a wide range of applications. When it comes to measuring accuracy the IPAQ 202 will impress you with its performance, ±0,1% of temperature span and long-term stability with deviation of maximum ±0,1% of span / year. The IPAQ 202 is a highly reliable and robust temperature transmitter. External influences such as the ambient temperature, vibrations, moisture and EMC have minimal influence on the measurement result. The transmitter can easily be configured from a PC by using the ConSoft software and a ICON Configurations kit. Thanks to the user-friendly interface, you can quick and easy set and re-set parameters like temperature measurement range, TAG identity and failure indication. Visit the product pages for additional information or contact us if you have any questions.